The majority of the solar thermal plants operating today provide hot water to households, for both sanitary purposes and space heating. Although the residential sector offers a huge potential for solar thermal applications, the industrial sector should not be ignored for two key reasons. First, this sector shows a remarkable relevance, covering about 28% of the total primary energy consumption for final uses in EU25. Second, a significant share of the heat consumed in the industrial sector is in the low and medium temperature range. About 30% of the total industrial heat demand is required at temperatures below 100 °C and 57% at temperatures below 400 °C. The areas of application with the most suitable industrial processes include cleaning, drying, evaporation and distillation, blanching, pasteurisation, sterilisation, cooking, degreasing and surface treatment. These two issues make the industrial sector a promising and suitable application for solar thermal energy. 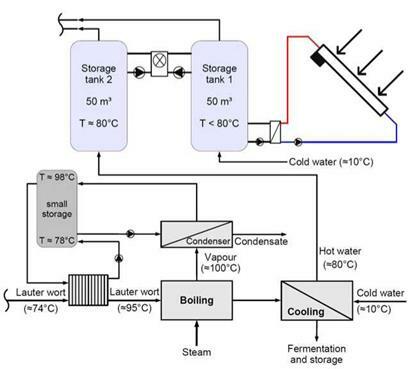 In the paper, both the results of the analysis of the existing solar thermal plants for process heat and the assessment of the application potential will be described. 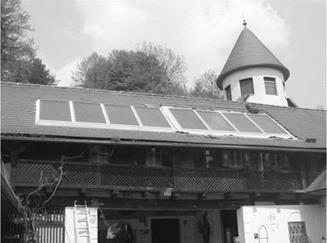 Both activities have been carried out in the framework of IEA SHC and SolarPaces Task 33/IV. Considering the new applications for solar thermal, the industrial process heat at low and medium temperature up to 250 °C is one of the most promising. Industrial sectors such as food, wine and beverage, textile, transport equipment (e. g. car washing), surface treatment (e. g. galvanic) and the chemical require process heat in this temperature range. The areas of application are numerous and include different processes such as cleaning, drying, evaporation and distillation, blanching, pasteurisation, sterilisation, cooking, degreasing and surface treatment. In addition, several built examples showed that space heating of factory buildings has to be considered one of the most promising applications of solar thermal in industry. performed in the framework of the IEA Solar Heating and Cooling Programme and SolarPaces Task 33/IV: the results are summarised in the present paper. At the end of 2006, the installed solar thermal capacity worldwide  was about 118 GWth (168 million m2). Compared with 144 GWel for wind and 5,5 GWel for photovoltaic, solar thermal is helding a leading position among renewables. The majority of the solar thermal plants operating today provide hot water to households. Although the residential sector offers a huge potential for solar thermal applications, the industrial sector should not be ignored for two key reasons. First, this sector shows a remarkable relevance, covering about 28% of the total primary energy consumption for final uses in EU25 . Second, a significant share of the heat consumed in the industrial sector is in the low and medium temperature range. These two issues make the industrial sector a promising and suitable application for solar thermal energy. One of the difficulties in walnut and carob trees propagation is the genetic variability and insufficient offer of grafted plants. In walnut trees, it is necessary to graft high quality buds in a walnut stem; whereas in carob trees, one of the techniques used is the stem cutting propagation. Both techniques require different temperature, light and humidity conditions. With the purpose of producing both species simultaneously, an existing chamber was set up to control the hygrothermal conditions inside it. In order to obtain the best rooting conditions, the proposal is to heat beds using a mixed sun-gas system by means of solar collectors and a gas water tank to heat the water circulating in pipes. In this work, the aim is to analyze the hygrothermal behavior of the chamber, the whole system operation, and the agronomic results obtained with the simultaneous walnut grafting and the carob rooting. Results show the advisibility of using solar collectors to heat the beds in production systems with the purpose of saving energy, stressing the high percentage of plants obtained. Due to the agronomic enterprises great demand for fruit plants, and the possibility to provide plants for the reforestation of degraded areas in the province of Catamarca — Argentina (28.38° South, 66° West, 600m above sea level), the need emerges to produce an important amount of young plants, specially walnut trees (Juglares regia L.) and carob trees (Prosopis Sp.). The technique most nurserymen use is the agamic propagation by means of micro grafts in walnuts, and rooting in carob plants. This latter technique consists of separating one stem from the mother plant and putting it in a mist system for root and stem growth. To obtain good results with these techniques, well controlled hygrothermal and light conditions are required so as to maintain all the qualities of the mother plant. cicatrization area in order to promote cell activity; they state that callus exposure to certain temperatures promotes the disorderly and variable cell multiplication in the grafting union and the root and stem growing zone. The walnut of the Prosopis genus multiplies itself naturally through dormant seeds in the soil. For this reason, the trees populations are heterogeneous, and inter specific hybridization is common. One way to obtain uniformity and superiority of the clones is by the vegetative propagation method, which eliminates the growing phase and shortens the time to reach reproductive maturity. To this end, stems of vigorous, healthy and identifiable plants should be selected. For the rooting process, beds are used which are heated with electric elements colocated under the cabinet containing the substrate where the stems are placed. Another alternative is the circulation of a hot fluid through pipes or tubes suitably placed. When the fluid is air, the infrastructure required is not expensive, but distant points piping becomes more expensive due to its low density and thermal capacity. This problem can be avoided by using water, but the investment is higher. For the walnut propagation, temperature and humidity ranges must be within certain limits. The temperatures ranges required are: from 18°C to 21°C for rooting, and from 21°C to 25°C in the apex and middle part of the plant. In order to avoid dehydration due to leaf water loss, room humidity must be about 80% for walnuts. For carob trees, optimum temperature in the rooting area is between 32°C and 35°C and a photoperiod of 12 to 18 hours . To carry out the simultaneous production of both species, a chamber was bioclimatically conditioned in already existing premises (like a greenhouse), located in the Experimental Station of the National Institute of Agricultural Technology (Instituto Nacional de Tecnologia Agropecuaria, INTA — Catamarca). The chamber was monitored in the initial stage , and modifications arising from the results obtained were implemented in the new period. For carob rooting, a bed was prepared by heating the place with water circulating through pipes placed under the substrate in order to maintain the optimum temperature. The water is heated by a mixed sun-gas system with the aid of a solar collector and a liquid gas container. In this work, the thermal behavior of the modified chamber is assessed analyzing the possibility of using it for simultaneous micro grafting and rooting, and the behavior of the rooting bed with the combined sun-gas system is also assessed. The hygrothermal and agronomic results of the trials are also presented here. The validation of the models is necessary to ensure that the calculated results are valid. Furthermore it is to proof what differences consist due to the assumptions made in the models. The different components were validated mainly with calculation results of other software. The comparisons showed good agreement of the new models with the references for steady state simulation. The validation of the receiver model has been done with calculation results for one day from the DLR TRNSYS simulation model. The comparison (see Fig. 3) showed a difference in the absolute values but it could be shown that the model has the same behaviour as can be seen by the calculation of the power that reaches the boiler. After the construction of the STJ is finished, the software will be compared with measured data of the operation. Through this validation, models can be verified with real values and it can be checked if they have to be adjusted to achieve better results. 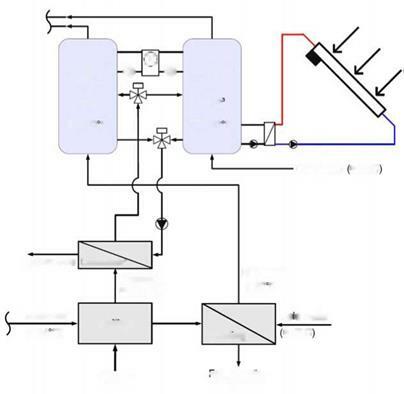 The created channel burner, which considers a complete combustion process, enables the calculation of the necessary mass flow of fuel which is needed for a certain required temperature. Furthermore the model calculates the resulting composition with certain species in molar fraction of the exhaust gas. Fig. 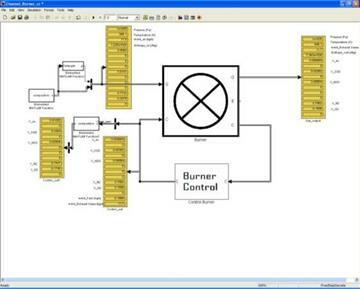 4 shows the attached burner model in Simulink. differences due to rounding errors. Other comparisons come to the same results though the model is valid for using it in the simulation. Data gathered in the framework of the IEA Task 33/IV include comprehensive information about the geographical distribution of the solar thermal plants, the industrial sectors addressed, the specific processes, the process temperatures, the solar thermal collectors technologies, the capacity installed, the type of back-up systems and some economics. This survey include the majority of the worldwide built examples with few exceptions such as China and Japan. At the present time data collection comprises 19 countries. Plants in operation in Austria, Greece, Spain, Germany, Italy and the USA represent about 75% of the total installed capacity reported. Currently about 90 operating solar thermal plants for process heat are reported worldwide, with a total capacity of about 25 MWth (35,000 m2). The size of SHIP plants varies from small (around 10 kWth) to large scale installations over 800 kWth. The majority of the SHIP plants operate in the sectors of food, wine and beverages, car washing facilities, metal treatments, textile and the chemical industries. Examples in food processing sectors (especially dairies) are particularly numerous: i. e. 20 plants corresponding to 23% of the sample. Wineries account for 4 of the 8 examples reported within the beverages sector, showing a large potential for future applications especially bottle washing and cooling of wine cellars. Solar car washing facilities are concentrated in Germany and Austria (8 examples), while dairies in Greece and in Italy (6 examples). 10 solar facade integrated systems are in operation in Austria for space heating of factory buildings, while in Spain the most recent solar thermal applications are mainly in the food (e. g. olives, meat and fish processing) and transport equipment sectors (e. g. washing facilities for lorries and containers). Solar heat is mainly used at 20-90 °C for process hot water, preheating of boiler feed-water and space heating (and cooling). Therefore standard selective flat plate collectors (FPC), working in the temperature range of 30-90 °С, result to be the most installed. Cost figures, available for about 50% of the plants analysed, range from 450 to 1,100 €/kWth with few exceptions and some differences at national level. These costs refer to plants built before 2006, while cost figures for more recent plants are not available. In Austria and Spain, the investment cost (plant size < 350 kWth) is in the range between 470 and 700 €/kWth, while costs collected for Germany and Italy in average are higher. Costs for Greek plants are lower because of some targeted marketing strategies adopted in the 90ies by the solar thermal companies. Most of the reported plants benefited of public contributions between 30% and 50% of the total cost.